I had six tomatoes in my fridge that I needed to use. I found a recipe for tomato pie that called for green tomatoes. These were ripe, but I’ve never been a big fan of green tomatoes anyway. 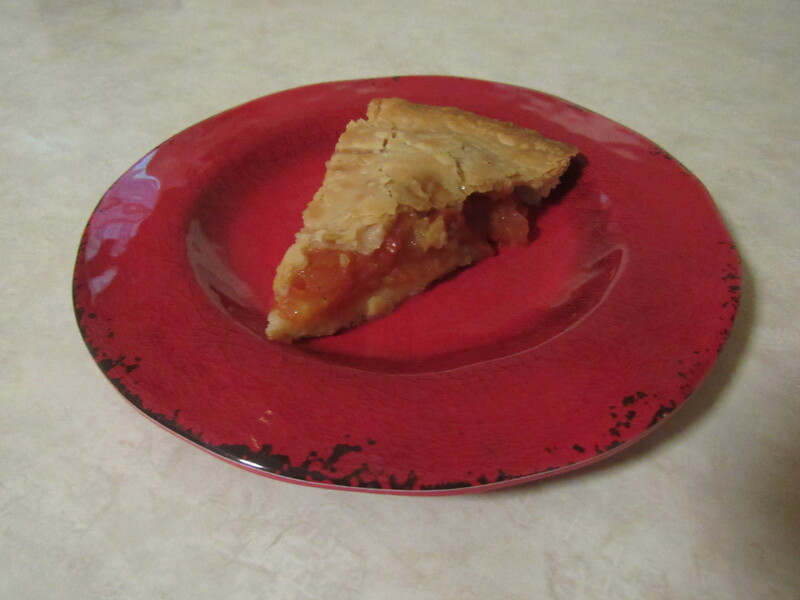 I decided to make the pie, substituting red for green tomatoes. Wash and slice tomatoes without peeling them. 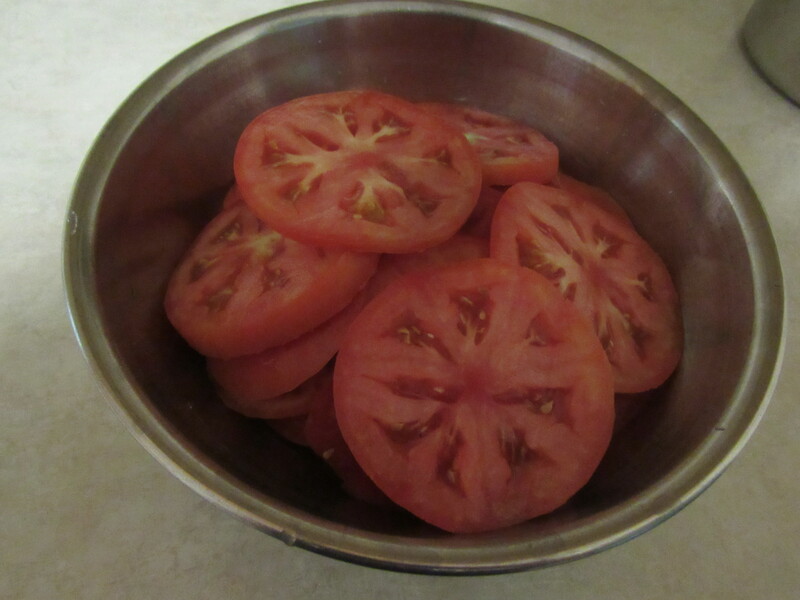 Put the tomatoes in a medium-sized saucepan with about a cup to a cup and a half of water. Cook over medium low heat until they start to become tender, about 15 minutes. I cringed a little, unsure how this spice would taste with tomatoes. I added ½ teaspoon nutmeg. 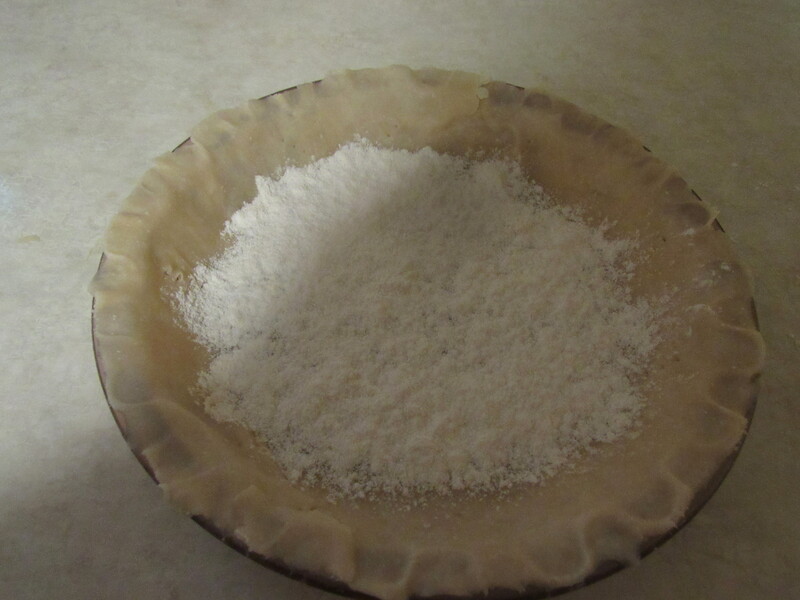 Hint: I learned a little trick from another 1877 cook when baking liquidy pie fillings: Mix 3 tablespoons of flour with 2 tablespoons of sugar. Sprinkle this over the crust. You may only use 1/3 to ½ of this mixture. It keeps the bottom crust from getting soggy. Using a slotted spoon, add stewed tomatoes to bottom crust. Then arrange the top crust over the tomatoes and add holes with a knife. Bake at 375 degrees for 40 to 45 minutes. I tasted the pie warm from the oven (not hot) and also cold. I liked them both. The small amount of sugar in the pie didn’t make it too sweet. There was just a hint of nutmeg. If you’d like more, add 1 teaspoon of nutmeg instead of ½ teaspoon to the stewed tomatoes before baking. Tomatoes are one of my favorite foods but I don’t like them roasted. I was surprised how much I liked this pie. Compiled from Original Recipes. Buckeye Cookery and Practical Housekeeping, Applewood Books, 1877. ← New Release-Audiobook for A Rebel in My House!